“Darkness cannot drive out darkness: only light can do that. Hate cannot drive out hate: only love can do that.” – MLK. “If you’re not ready to die for it, put the word ‘freedom’ out of your vocabulary.” – Malcolm X.
Warwick, RI – On Friday, Jan. 30, I had the pleasure of attending Ocean State Theatre Company’s (OSTC) opening night production of “The Meeting”, an intense and thought-provoking show written by award-winning and internationally known playwright Jeff Stetson. 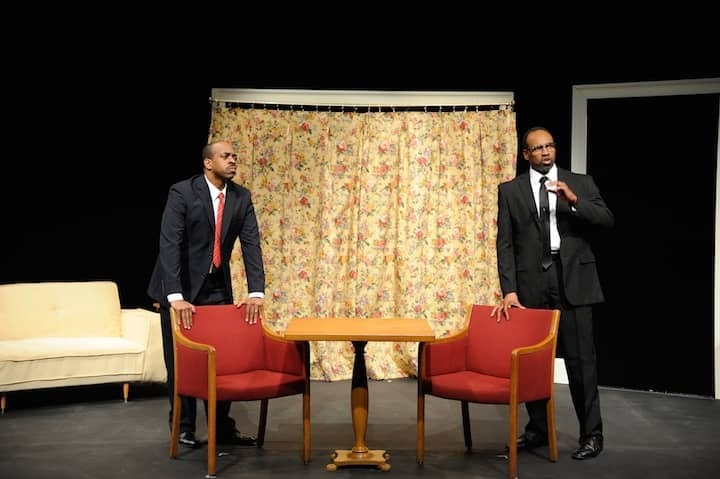 “The Meeting”, which is running through Feb. 15 at OSTC in Warwick, is a superb enactment of an imagined conversation between Malcolm X and Dr. Martin Luther King, Jr. The production features Damron Russel Armstrong as Malcolm X, Marcus Denard Johnson as Dr. King, and Tony Mitchell as Malcolm X’s bodyguard, Rashad. The conversation between the two civil rights leaders is deeply moving, sometimes heated and confrontational, and occasionally interspersed with humor and humility. Both men place their shared hope for peace and civil rights center stage, while recognizing that the roads they have chosen to follow will never meet in their lifetimes. The power of this play lies not only in its historical examination of two central leaders of the civil rights movement and their differing philosophies but also its relevance to current issues of social justice and equality in America today. Actors Damron Armstrong and Marcus Denard Johnson offer the audience impassioned portrayals of both Malcolm X and Dr. King, while also providing insights into the leaders’ opposing philosophies and their radically different personalities. The Meeting is set in a Harlem Hotel room in February 1965, one week before Malcolm X is assassinated and a little less than three years before Dr. King is himself gunned down. Although I had expected “The Meeting” to be simply a philosophical discussion between two principal figures of the civil rights movement, the playwright injects drama and surprise to create unexpected and telling dialogue. Malcolm rails against Dr. King’s non-violent approach, at one time telling him, “you can’t sacrifice your own people and expect to win”, while Dr. King tells Malcolm that “[sacrifice and] non-violence was the only way to affect change”. The playwright set this fictional encounter between Malcolm X and Dr. King on the day of the early morning fire-bombing of the former’s home, in which everything was destroyed. Although Malcolm and his family escaped unharmed, it certainly explains why Malcolm is agitated throughout most of his conversation with Dr. King. His anxiety subsides near the end of the meeting when he discovers the nature of the gift that Dr. King has brought. Martin argues that Malcolm’s methods threaten the gains that they have made. Malcolm responds that the only reason Dr. King’s movement won concessions was because “I was the alternative”. Malcolm neatly sums up the philosophical differences between his movement and that of Dr. King when he tells him, “You tried to stop whites from hating us, (while) I tried to stop us from hating ourselves”. At one point in their conversation, Malcolm tells Dr King, “A black man can be killed in America without consequences”. Martin responds that he is appealing to the conscience of America, to which Malcolm replies, “This country has no conscience”. This compelling production is an opportunity to expose your children or grandchildren to an important message. It provides an opening for discussions with family and friends regarding past as well as ongoing issues of civil rights, social justice, and equality. Ocean State Theatre Company is located at 1245 Jefferson Boulevard in Warwick. Tickets are available by calling (401) 921-6800 or online at www.oceanstatetheatre.org. Performances are Wednesday through Saturday at 7 p.m., with matinees on Thursdays, Saturdays and Sundays at 2 p.m.